AMA KTM Round 2 of the "Mt. Shasta Dual Sport Series" August 22nd and 23rd, 2009. 2 days of great weather, and challenging routes on day 1 made this years "Siskiyou Dual Sport" a great success. Lunch was in Coffee Creek and there was a Saturday night get together at the Shasta Brewery in Weed. . Day 2 was a change of pace with a fast paced ride to Etna and the Etna Brewery for lunch and gas. A perfect way to spend a Sunday afternoon. Temperatures were in the low 80's and the Etna Brewery was the perfect place to cool the boots and have one of their award winning brews. The ride was attended by members of the San Francisco Fire Department, The Sonora Motorcycle Club, riders from the Yosemite area, Sacramento and as far South as Los Angeles. Also in Attendance were Don Amador of the Blue Ribbon Coalition and Steve Croucher president of the Medford Motorcycle Riders Association. A special thanks to Stan Summers of Bend OR, Scott Linden of Mt Shasta, the Dual Sport Crew with the Redding Dirt Riders, the Best Western Tree House in Mt. Shasta and and Weed ale, for making the ride a great success. The 2009 Redding Dirt Riders Shasta 2-day Dual Sport Ride was a success! Thanks to to Fators KTM Suzuki, Redding Yamaha-Seadoo, Cycle Salvage, and Lee Honda for the great raffle prizes! 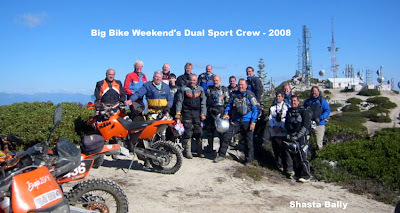 The next RDR 2-day event will be an AMA KTM National Dual Sport out of the Mount Shasta Ski park September 12th and 13th, 2009. We're looking forward to another great event with new routes and lots of great surprises. The July 11th and 12th AMA KTM National Dual Sport event at Mount Shasta was a big success! 55 riders rode the two day event, enjoying the scenery, route and great weather. Special thanks to the Shasta Trinity National Forest for working with us, The Mount Shasta Board and Ski Park for camping us the ski park for the weekend,Stan Summer of the Frostbite Enduro Assoc. Bend OR, and the Redding Dirt riders for all of their help. It was a fantastic Dual Sport weekend and a fabulous tour of the North State.! Big Bike weekend was a big success on October 11th 2008, after 4 pre rides and route checks, we came up with a great route for the City of Redding/ McConnell Foundation's Big Bike Weekend. Mike McLaughlin, Scott Exely, Matt Smith, Dave Guglimetti, Karl Hankins, and Casey Crandall. The "Day Of" crew consisted of Bruce Schroeder, Rick Bowser, Glen Mcneely, Ray Labahn and Mike Wilbur, all members of the Redding Dirt Riders. The 2009 Big Bike Weekend's Dual Sport loop began at the Redding Convention Center's South parking lot and headed out the 299 west to Old Shasta. We rode around the backside of Whiskeytown Lake on through to Carr Powerhouse and onto Lewiston Turnpike, a historic stage route that was used for carrying the mail and gold out to Lewiston, Weaverville and on to the coast. From Lewiston the Dual Sport group rode North on County Line Road to Trinity Mountain. From Trinity Mountain the group headed out French Gulch to the 299 and on Redding. A big thanks to the Redding Dirt Rider's Bruce Schroeder for handing the administrative responsibilities for the event and to Connie Grinols of the McConnell Foundation for including Dual Sport as an official event of the Big Bike Weekend.. Under Sunny skies a group of 10 riders departed Jay's Market in Old Shasta, CA at 9 on Saturday morning. The route took riders through Historic Old Shasta, the stomping grounds of the notorious Black Bart, and headed up Mule Town Rd. for a dirt ride around the southern shore of Whiskeytown Lake. From the Lake, riders headed west on Hwy. 299 to the Lewiston Turnpike, a one lane stage route used during the gold rush to transport Gold and Mail through the Deadwood/Buckhorn area, home to bandits and Indians waiting for the stage. Riders refueled and snacked in Lewiston and then headed once again to Hwy 299 west in the direction of Douglas City. The route turned South on Deer Lick Springs Rd., which was the main route to Wildwood. The ride then headed down to Deer Lick Springs for photo ops at the Deer Lick Springs store. Deer Lick Springs, originally opened in the 1920's was once a thriving resort location that offered mineral baths, dances and parties and had cabins and a general store with all the supplies needed for a weekend or a Summer in the woods. At one time, the water from the mineral springs was bottled and distributed nationwide. The store, cabins and mineral baths still remain and are available upon advanced notice. call ahead for reservations. From Deerlick Springs the route headed into Wildwood and the Wildwood store for some burgers, pattymelts and awesome french fries. All of the food, soups and salads are homemade, and word has it the the spaghetti is incredible. After Lunch the group headed East on Hwy 36 to Platina Rd. and on to Mule Town Rd. to make a complete 160 mile loop of Shasta and Tehama counties. Under sunny skies, approximately 42 Dual Sport and Adventure riders gathered at Dry Creek Station Bar and Steak house in Bella Vista, CA. Riders from Shasta County, Sacramento, Monterey Bay, Auburn, and the San Francisco area staged to participate in the first Norcal Dual Sport event of the year. The group left Dry Creek at 10 am, heading North on Dry Creek road to hit the dirt of Backbone Ridge in Jones Valley, CA. The Backbone trail provided great views of Lake Shasta, Mount Shasta, Mount Lassen and the entire Shasta County basin. Visibility was over 80 miles and the day was bluebird. Once across the ridge the group descended to Highway 299 via McCandless Gulch Rd. Turning Left on Highway 299, the riders stopped at the Golden Bear Store in Round Mountain, CA to top off the tanks, take pictures and enjoy food from the deli. After the brief break in Round Mountain, the riders headed east on 299 to Fenders Ferry road, Shasta National Forest Route 27. Stops on Fenders Ferry included Pitt River Bridge, Potem Falls, Madrone Campground, Squaw Creek, and finally the Mc Cloud River bridge for a BBQ of tri-tip sandwiches provided by Q's Barbeque of Anderson, Ca. For a majority of the group, the BBQ signaled the end of the dirt action for the day, but close to 15 riders in separate groups headed out on the second portion of Fenders Ferry Rd. The trailblazers headed out on the un scouted portion of the ride to encounter downed trees and an abundance of snow. 25 miles from Gilman Road and the Mc Cloud river bridge, the riders emerged from the forest to cross the Sacramento river at the Dog Creek bridge, jump on Interstate 5 at Volmers Road and head South back to Redding. Riding sweep on the entire group, I rode with Charlene Ruiz, a retired Sheriff from Oroville, CA that rode her DRZ 650 from her home in Oroville the morning of the ride - very tenacious!! Under perfectly blue skies, the O.S. 100 Dual Sport ride went off without a hitch. After a brief rider’s meet and greet, the group of close to 50 riders left the Old Shasta California post office parking lot at 9:30 a.m. The range of bikes was quite interesting. There was a lot of orange; about 75% KTM riders. Several KLR’s showed, XR 600’s, 650’s, Kevin Dauphinee on his groovy late 70’s Suzuki and several Honda and Yamaha 250’Fs. The group of mixed bikes and ability levels headed over Mule Mountain Road into Whiskeytown NRA. The Dual Sport route then ran south of Whiskeytown Lake on Pelletier and South Shore roads. The pack thinned out as the riders came to Carr powerhouse road and then headed west on Hwy 299 to French Gulch. The Dual Sport route took Tom Green Mine Road over Deadwood pass and headed for Lewiston, CA. About three miles form Lewiston a DRZ 400 with valve problems was sidelined. A quick tow strap was constructed and the DRZ was towed three miles into Lewiston by a KLR 650. The Bike was loaded and driven back to Redding. Once in Lewiston, riders refueled their Dual Sport bikes, ate some lunch at the Mountain Valley Grill (awesome pies!) and headed back over Deadwood returning to French Gulch by way of French Gulch rd. The lead group of KTM riders led by Redding Dirt Rider president Randy Mitchell, treated the group to some of Shasta Counties best single track. The following groups stayed on the Dula Sport routes scenic main fire roads and provided some incredible views of Mt. Lassen and Mt. Shasta. The Dual Sport route left French Gulch rd. and proceeded North on Trinity Mountain rd to East Fork. Motoring west on East Fork the route then headed into Shasta Chappie ORV area, using trail 1 and and again led by the Redding Dirt Riders took varied single track descending to the Shasta Dam. The Dual Sport Riders then took Coram rd. to trail 3 and exited Shasta Chappie at the Copley Mountain staging area. Heading South on Iron Mountain rd., the group quickly dissipated – this being the 100-mile point. A group of about 10 riders headed east on Hwy 299 to Hwy 44 east to Airport rd. and headed to Burrito Bandito for a post - ride recap. The total distance: 120 miles. Hope to see you on our next ride!